Twenty organizations from across the country were recognized for the creation of innovative solutions and services that, thanks to unique value propositions, are positively impacting partners and channel customers across Canada. 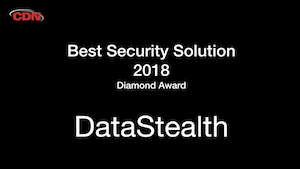 DataStealth was awarded the Diamond Level Award for Best Security Solution 2018. Data and cyber security at an enterprise level have been a big topic of discussion this year, we continuously hear about more and more data breaches jeopardizing people’s personal information. Mississauga-based Datex thinks its found a solution to ease some of those concerns with its security software DataStealth. The software company focused on providing tokenization, de-identification and encryption services used its software to help a Canadian company in the financial services industry protect customers’ information while helping meet industry audit and compliance requirements. It helped them earn this year’s Best Security Solution award at CIA. DataStealth is what Amyotte called a “plug-and-play solution” that can be used with a company’s current applications or technology architecture. In order to secure data it uses a unique algorithm to secure the original information, which “inspects the data, extracts sensitive information and replaces it with a substitute.” And this, said Amyotte, combined with meeting the necessary compliance, governance and audit requirements, is what sets Datex’s security solution it apart. According to Amyotte, from the first meeting it took less than 60 days to “deploy” the customer’s new service. He claimed that this type of timeline is typically unheard of in traditional tokenization (which is the process of substituting a sensitive data element with a non-sensitive equivalent).